When I had seen McCalls Patterns early fall release, I knew that McCalls 7800 was going to be a great piece to transition from fall into the winter months. 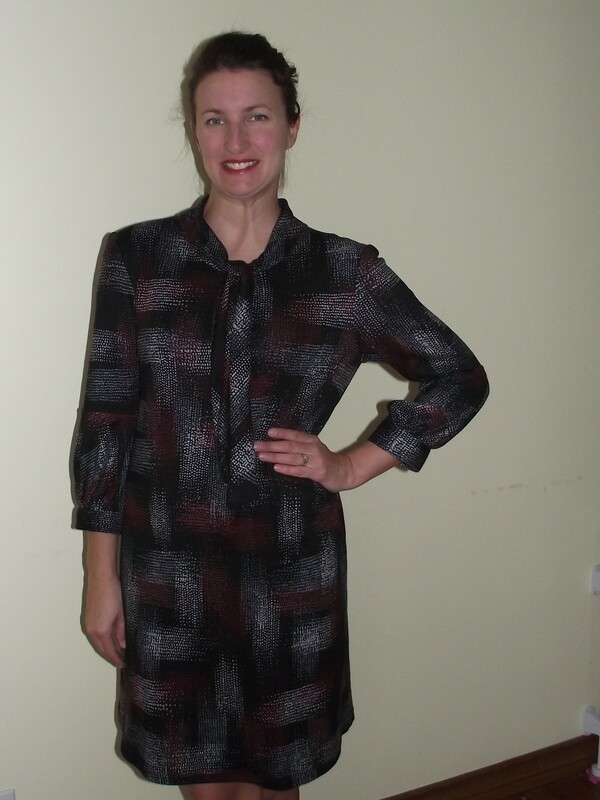 All you need, is a beautiful fall/winter fabric and you’ll have a fabulous dress for the colder months. I chose to make McCalls 7800 in view C, using the Melange Printed Sweater Knit – Dots- Black/Red. This fabric was such a nice knit to work with. I personally find some knits very tricky to work with, especially with hemming, but this fabric was a dream. 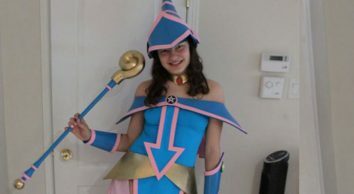 I have thoroughly enjoyed the whole process of sewing this garment together. The colors scream fall and winter to me. I love a great red or burgundy color for the fall and winter months. 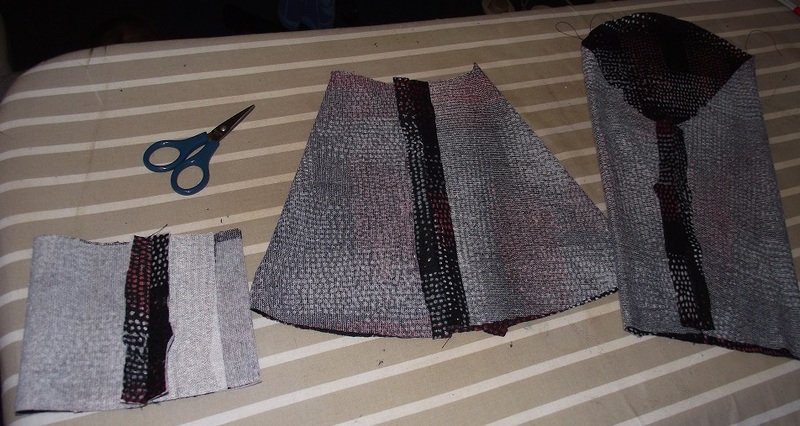 The dots on the black fabric are a mix of white, grey, red, and a little bit of coral. This fabric is on sale right now, so be sure to pick yourself up 2 meters of this beautiful sweater knit. It comes in various designs and colors that you can see here. For the pattern, it is rated as easy on the back of the pattern envelope and I completely agree. I love how this pattern has small details for making the garment look beautiful on the inside as well as the outside. 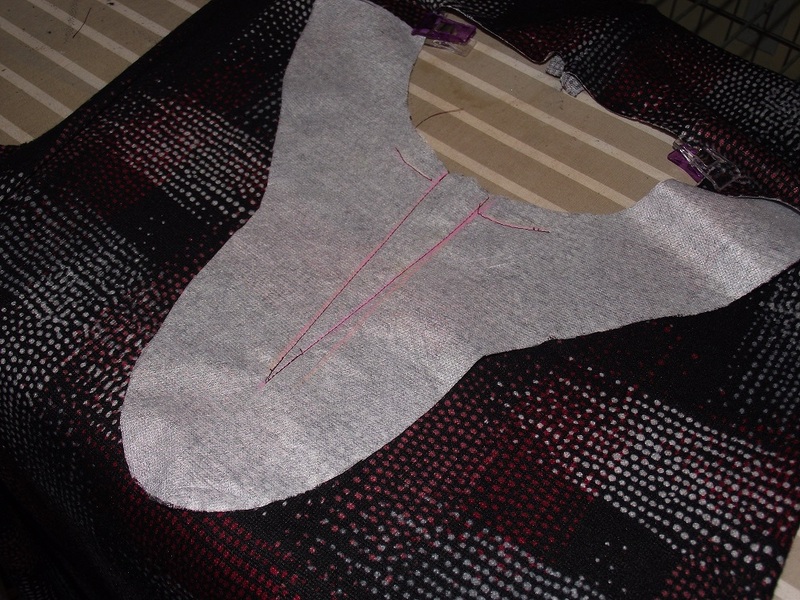 For view C, the pattern calls for a neck facing which is then hand stitched into place at the shoulder seams. View C also has a neckband and tie that is first sewn on and then hand stitched on the inside creating a beautifully finished neckband on the inside. There are many different sleeve options that you can mix and match with the different views, which is one of my favorite features of this pattern. For view C, the sleeves are a 3/4′ length on me. The band at the bottom of the sleeve is also hand stitched underneath. For the sleeves on my dress, there are 3 pieces to the sleeve. 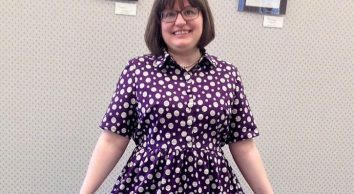 I sewed a size 14 and I completed a small bust adjustment using a couple videos and a book for guiding my way through the process. 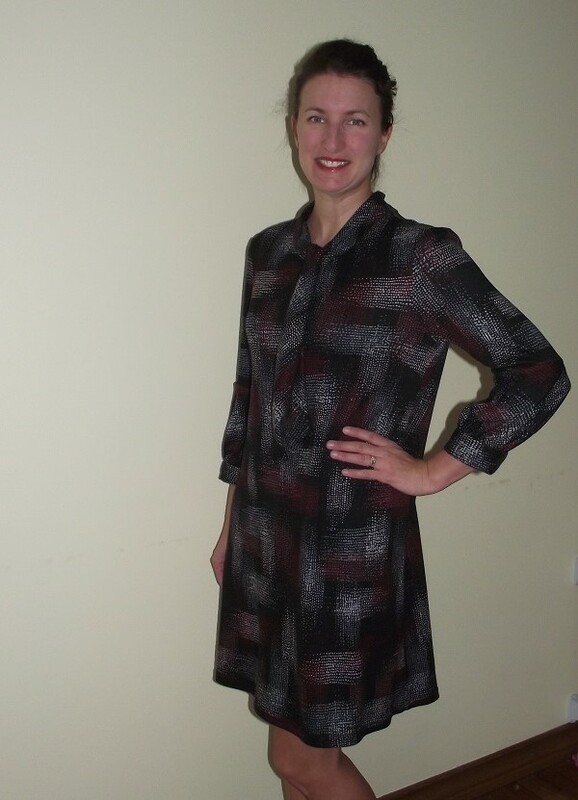 This dress is loose fitting and very comfortable, making it a great outfit for all those family gatherings and dinners that are in the future. The pattern calls for wovens and stable knits. I’m really excited to try out this pattern in a woven next. The neck tie is a really cute feature of view C. The pattern called for fringe trim, which I decided to leave out of my make. In the future, I can see making view C again, but using a contrasting, or a solid color for the neckband and tie. The fringe trim would also be a cute detail to add. If you love a comfortable loose fitting dress, this is your go-to pattern, with all the sleeve variations and the different types of fabrics you can work with, the possibilities are there. You could even pair this dress with tights or leggings for the colder months. I’m excited to see what you will be sewing for the colder months. 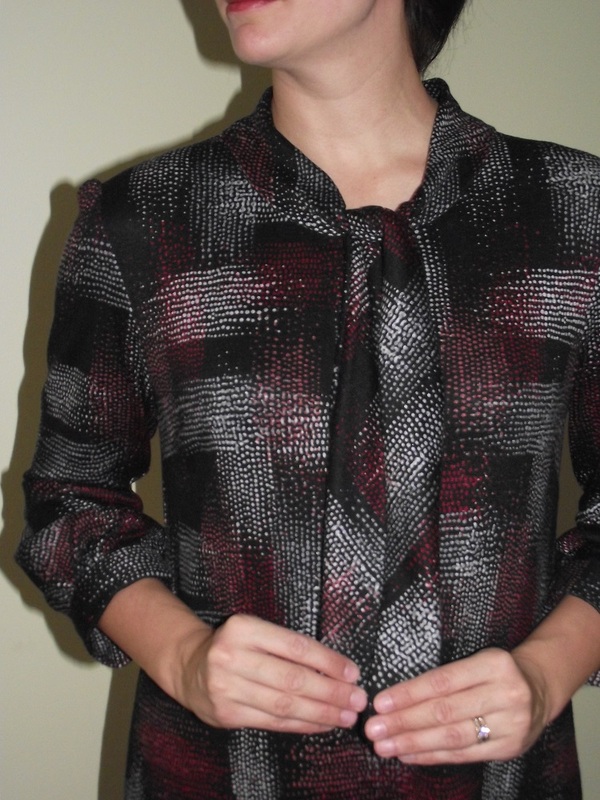 Thank you for reading about my experience sewing with the Melange Printed Knit.